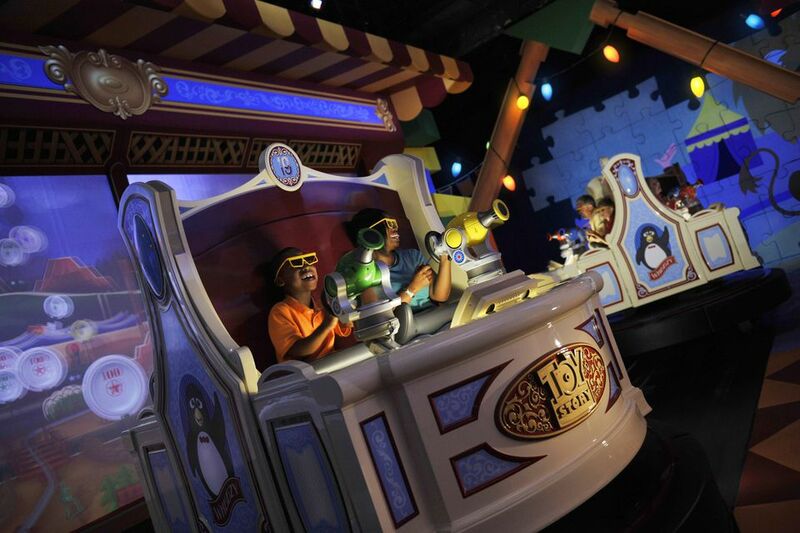 A landmark in interactive theme park attractions, Toy Story Mania takes ultra-flashy video game technology, embellishes it with 3-D graphics (yep, riders wear dorky 3-D glasses), presents a game play experience that appeals to everyone from toddlers to the most experienced gamers, and wraps it all together using the engaging characters from the Toy Story films. The result is a giddy and highly addictive attraction that has nearly maniacal guests hell-bent on beating their ride-mates—and jumping back in line to trounce them again and again. As the ride vehicles travel between the game screens, they move somewhat quickly and partially spin. Also some of the scenes between games are briefly dark. Toy Story Midway Mania (as it is known in California) is right at home amid Pixar Pier's actual midway games. The turn-of-the-century, Victorian-style building beckons riders, as does the wisecracking Mr. Potato Head stationed out front. The interactive, animated character (featuring the voice of late comedian Don Rickles) is highly sophisticated and acts as a traditional carnival barker—although with throngs of guests jamming the queue of the popular attraction, he serves more as a diversion to those whiling away their time in line than as a shill for the ride. Toy Story Mania, which had already been operating at Disney World in Florida, joined two new attractions, Slinky Dog Dash and Alien Swirling Saucers when Toy Story Land opened in 2018. To accommodate the new land, the entrance to the existing ride was moved to the other side of the show building. The resort also expanded the capacity of the popular ride when it built Toy Story Land. The attraction uses four-passenger vehicles, with two players sitting on each side of the vehicle. Each guest has his own "spring-action shooter" (which actually uses magnets and has no springs or any mechanical parts) to fire virtual objects, such as eggs and rings, at the simulated carnival games. Two vehicles, with a total of eight riders, move in tandem through the attraction and stop to play five games plus a practice round. Each set of two side-by-side riders gets its own screen for each of the games and the players compete against one another for the same targets. The individual games last 30 seconds and the entire attraction lasts about five minutes. The conceit of Toy Story Mania, reinforced by the five-foot Mr. Potato Head and the larger-than-life toy package in the loading area, is that riders have been shrunk to the size of a toy (which is the concept throughout Toy Story Land in Florida). The vehicles themselves are supposed to be toys that take passengers into the bedroom of Andy, the human character from the Toy Story movies. As they move from screen to screen, riders pass oversized building blocks, board games, and other items strewn about the room. Among the games are Bo Peep's Baa Loon Pop, a dart game, and the Green Army Men Shoot Camp, a plate-smashing game that uses virtual softballs. The ride includes 4-D effects, such as blasts of air from ring-tosssed rockets and sprinkles of water from popped water balloons. Each scene has targets with varying degrees of difficulty and point value. The higher-value objects are mostly tucked along the outer edges of the game play area or placed on moving targets. Should players stick with the big-point targets? I don't think so. The onboard cannons have an unlimited supply of ammo, are very responsive, and are capable of launching rapid-fire volleys. My advice: Scope out and aim for some of the big targets before your seatmate has a chance to nab them, but keep tugging nonstop on the shooter and take out easier targets as well. The final game, following Woody's Rootin' Tootin' Shootin' Gallery (you gotta love the names), is a challenge round. Here, the targets are large and in plain view. The goal is to simply fire at will with more gusto than your opponent. It's easy to track the game play since the ammo is the same color as the shooter, and the 3-D perspective, which renders the computer-generated imagery with a convincing sense of depth and realism, allows players to follow the trajectories of their ammo (something the Buzz Lightyear shooter ride at Disneyland and its ilk sorely lack). Aim high and to the right for example, and the launched objects take a predictable arc. Some of the targets include hidden bonuses; hit them once, and they morph into higher-scoring targets. 12-year olds and their grandparents can enjoy the ride together. Even non-game warriors should find the controller and the game experience quite intuitive. It can be sobering to see the top scores of the day and month posted at the end of the ride. How are Toy Story Mania whizzes able to rack up over 300,000 points? Part of the trick is in firing the shooter as rapidly as possible. To keep lobbing ammo with minimal effort, many successful gamers seem to prefer placing their arms in a horizontal position and grabbing the actuator from the side. It looks weird, but it works well. Also, Easter eggs with really big-value targets are hidden among the games. To unlock them, opponents apparently have to work together. The ride is so addictive, your wrists may actually hurt after repeated attempts to better your score. The final challenge round is a killer. Perhaps the American Psychiatric Association should acknowledge a new ride-inspired diagnostic disorder: Toy Story Mania mania.